What was built in 1912 as a farm implement store will soon be the first event facility of its kind in the heart of downtown Mount Horeb, Wisconsin. 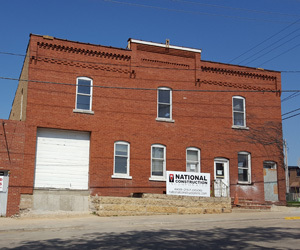 The brick structure at 108 S. 2nd Street also functioned as a tractor repair shop, car dealership, storage facility and veterinarian’s office throughout its history. Now National Construction is transforming its 11,080 square feet into a remarkable reception and meeting space, with plans for incorporating a bar, restaurant or other retail store. A deck on the south side will overlook the Military Ridge Bike Trail. The project is one of four destinations along the developing Front Street in Mount Horeb, including The Grumpy Troll, the Mount Horeb Area Historical Society’s Driftless Historium, and National’s construction of a new Duluth Trading Company headquarters.